Made of high quality black/red fabric & black PVC leather. 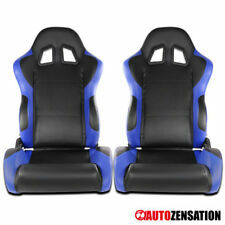 Racing seats. Racing seat belts. Reclinable racing seat is adjustable from the handle on the side. Make your car look unique and more aggressive in racing style, provide best comfort, support and safety during hard cornering and aggressive driving. Racing seats. Make your car look unique and more aggressive in racing style, provide best comfort, support and safety during hard cornering and aggressive driving. Racing seat belts. Reclinable racing seat is adjustable from the handle on the side. Seats are forward and backward reclinable. Included: adjustable universal sliders and necessary screws. Made of high quality black/ blue PVC leather. Comfortable Reclining Racing Seats. Tail Lights. Reclinable racing seat is adjustable from the handle on the side. Make your car look unique and more aggressive in racing style, provide best comfort, support and safety during hard cornering and aggressive driving. Seat is fully reclinable using black quick release handle. Included: adjustable universal sliders and necessary screws. Seat is made of high quality cloth material with a black center and gray carbon fiber-style trim design. Seat is fully reclinable using black quick release handle. Seat is made of high quality cloth material with a black center and gray carbon fiber-style trim design. Comfortable Reclining Racing Seat. Seats are made of cloth material with black center and gray trim designs. Comfortable Reclining Racing Seats. Seats are forward and backward reclinable using the quick release handle. Tail Lights. Demo / Installation Video. Made of high quality steel blue/black fabric. Racing Style Seat. 4-point racing harness pass through. Rear Bumper Step. Demo / Installation Video. Included: adjustable universal sliders and necessary screws. Made of high quality black/ red faux suede (center) and PVC leather (sides). Seat is forward and backward reclinable (recliner handle is on the left side). Made of high quality black/ red faux suede (center) and PVC leather (sides). Seat is forward and backward reclinable (recliner handle is on the left side). Comfortable Reclining Racing Seat. Demo / Installation Video. Made of high quality black/red cloth material and black PVC leather. The quick release handle can be found on the lower left side of the seat. Demo / Installation Video. Seat is forward and backward reclinable (recliner handle is on the left side). Included: adjustable universal sliders and necessary screws. Made of high quality black/ blue PVC leather. Comfortable Reclining Racing Seat. Made of high quality black PVC leather with double red stitching. Comfortable Reclining Racing Seat. Seat is forward and backward reclinable using the quick release handle. Demo / Installation Video. Seat is made of cloth material with a black center and gray trim design. Comfortable Reclining Racing Seat. Seat is forward and backward reclinable using the quick release handle. Tail Lights. Demo / Installation Video. Seat is made of cloth material with a black center and gray trim design. Comfortable Reclining Racing Seat. Seat is forward and backward reclinable using the quick release handle. Demo / Installation Video. Made of high quality black/red cloth material and black PVC leather. The quick release handle can be found on the lower right side of the seat. Demo / Installation Video. Made of high quality black & white PVC leather. Reclinable racing seat is adjustable from the handle on the side. Make your car look unique and more aggressive in racing style, provide best comfort, support and safety during hard cornering and aggressive driving.